Thank you for another wonderful visit, and especially for accommodating our family on such short notice! My wife and I have come to love Bermuda during our last few visits. It was nice that we could return with our girls this time, even if only for a few days. With the whole family in tow and multiple contests utilizing a lot of bandwidth during the weekend, operating time was limited. 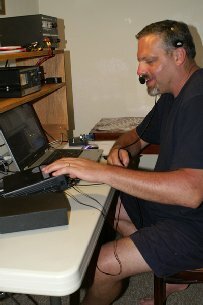 But, I still managed to eke out 501 QSO's from the "DX Chair". Conditions on the low bands were the quietest I've heard them from Bermuda, and I was surprised to log 151 contacts on 30M RTTY. I will be posting additional information on my website at http://www.k3trm.com/. We all look forward to returning again soon...for a much longer visit next time! Until then, I'll be listening for you on 6m!